I am a biologist who specializes in entomology, the study of insects. For the past three years, I have been building a checklist of the moth species present on Paul Smith’s College lands. I have documented over 300 species of moths in the forests and wetlands of Paul Smith’s College! Forested lands harbor a large number of moth species whose caterpillars feed on the leaves of living trees but it doesn’t stop there. The caterpillars of some species of moths feed only on fallen leaves, some species feed on lichens or on non-woody plants. This huge diversity of caterpillars represents an important food supply for other animals in the food web. Most species of moths in the Adirondacks have large geographic distributions and occur across the northeast but some moths specialize on boreal plant species that may not exist south of the Adirondacks. Establishing a current checklist of species will be important as a baseline. If the geographic ranges of host plants change in the future, the composition of the moth community may also change. If seasonal temperatures change, insects may mature slightly faster or more slowly, so I also gather data on flight periods, the dates in which adult moths of a particular species are encountered. One of the largest-sized moths we have locally is the Columbia silk moth, Hyalophora columbia, which feeds only on the tamarack/larch tree. This boreal tree reaches the southern end of its geographic range here in the Adirondacks. I was able to document the presence of the columbia moth in four counties in the Adirondacks. Its presence in New York had not been documented in over 50 years. Like most giant silk moths, adults do not feed and only live for about a week. It is challenging to locate adult silk moths during the short time period when they are on the wing but citizen scientists can help in this effort. I am the Director of Project Silkmoth, a citizen science project to document sightings of giant silk moths in northern New York State. If you want to know more about these large, beautiful moths, or submit a sighting, visit my Project Silkmoth website. 2018 Mihuc, J.R. Boreal pine looper (Nepytia pellucidaria): A rare moth to look for this fall? 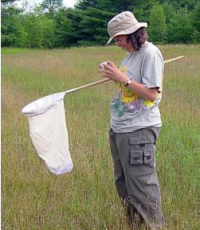 Newsletter of the Vermont Entomological Society 100: 9. 2018 Mihuc, J.R. & T. L. McCabe. Nepytia pellucidaria (Packard) (Lepidoptera: Geometridae) in New York State. News of the Lepidopterist’s Society 60(2): 66-67. 2016. Mihuc, J.R. Recent records of Hyalophora columbia (S.I. Smith, 1865) (Saturniidae) in New York State. News of the Lepidopterist’s Society 58(4): 178-81. 2008 Woodcock, T., C. Evans, C. Laxson, R. Tucker, J. Allen, J. Mihuc, E. Allen, T. Mihuc. Land use designation and vegetation community structure in the Adirondack Uplands (New York, USA). Applied Vegetation Science 11: 509-520. 2006 Mihuc, J. R. T. B. Mihuc, T. Woodcock, E.A. Romanowicz, T. Jackson, L. Myers, K. Spring, C. Tran, J. Bulova. E. Evans and D. Welch. Composition of stream benthic macroinvertebrate assemblages in managed and Preserve Adirondack (New York, U.S.A.) headwater catchments. Verhandlungen der Internationalen Vereingung fur Theoretische und Angewandte Limnologie 29(4): 1921-1924. 1999 Mihuc, J.R. & D. Streubel. Investigating decomposition and the soil community using soil microcosms. American Biology Teacher 61:612-615. 1997 Mihuc, J.R., C.H. Trost & T.B. Mihuc. Shorebird predation on benthic macroinvertebrates in an irrigation reservoir. Great Basin Naturalist 57:245-252.